Wifestyles Blog & Photography: Paying it forward! Saturday night Justin lost his wallet. After a couple hours of searching with no luck he lost all hope in ever seeing it again. He began the process of canceling his credit cards and making arrangements to replace them. Who said good people no longer exist?!? I can't begin to describe how thankful we are for what Phil did for us. If this doesn't make you want to pay it forward I don't know what will. This really opened up my heart tonight, I'm so thankful God is still working in others hearts like Phil's. This makes me want to be a better person and strive to always do the right thing. I love this! Such a great reminder about how good people can be. Glad your hubby got his wallet back. Wow. That totally gave me goosebumps. What a wonderful man. SO amazing that there are still good people out there. What a sweet man!! That is amazing!! Def. someone with "old school" values! That is awesome! Gives me hope that there are some good people left!! 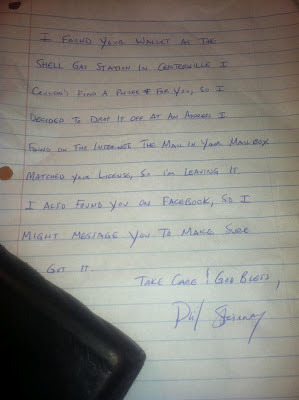 It's good to know there are still good people out there :) Glad your husband got his wallet back! That is so cool and very reassuring that good people still exist! Wow what a nice guy!! You don't expect that anymore once you lose something like a wallet. Very cool. wow, girlfriend!!! this is beautiful!! it almost brought me to tears! God is so GOOD! This is such an incredible story! When you leave your purse or wallet somewhere-you assume that everything is gone for good and ya better start calling and canceling credit cards. You always expect someone to steal it. Hearing this story made me smile! Knowing there are still good people out there...I wish it would spread around! People just need to be friendly, smile, and treat others the way they would want to be treated! This is nice! Check my blog and follow me if you want! OMG are you ever going to do another "VLOG"? Love those! I love that!! How sweet!! It makes me happy to know there are still others out there who do the right thing! Losing your wallet is the SCARIEST feeling....uhh!! Hi there. I have been following your blog for sometime now. I must say, you seem a little obsessed with yourself.